Bomb proof! Extremely healthy, repeat flowering and quick to grow. Produces large trusses of single, red flowers over a long season. 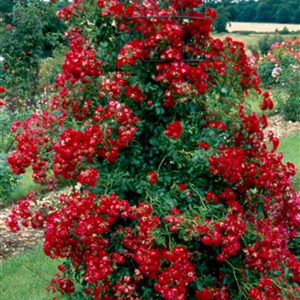 A modern, repeat-flowering rambler bearing large trusses of single red flowers which appear in flushes throughout the season. Small, glossy, medium green foliage with excellent disease resistance. Ideal for walls, pillars and arches. This is what we call a good do-er! Winner of the RHS Gold Standard Award, 2007 and bred by Colin Horner. PLEASE NOTE: NO DELIVERIES ARE MADE OUTSIDE THE UK. We have two methods of delivery depending upon whether the roses are potted or bare root. We are sorry but we only ship to Mainland UK. For more information on the difference between bare root and potted plants visit our page on buying roses here. Potted roses can be ordered for delivery from August to April only. Bare root/field grown roses can be ordered for delivery from November to February only. Order placed in October & November have a lead time of 4-5 weeks. Ordering and Deliveries are suspended May to July. Orders Containing Potted Roses – Mainland UK. Potted roses are shipped August to April only. You can pre-order your potted roses all year round, but fulfillment and delivery of your order will not take place until August to April. All containerised (potted) roses will be despatched via a carrier using their overnight service. Orders must be received before 11.00 AM for delivery the following day. Delivery days are Tuesday, Wednesday, Thursday or Friday of each week (no potted deliveries take place between April and October or at weekends and Bank Holidays). Similarly, our carrier does not collect from the nursery on Bank Holidays either, therefore delivery days will be adjusted accordingly. Please specify which day you would prefer and we will do our very best to ensure the package arrives on your chosen day. Orders Containing Bare Root (field grown) Roses – Mainland UK. 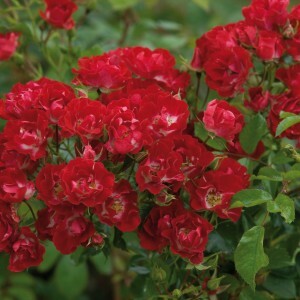 Bare Root roses are shipped November to February only. You can pre-order your bare roses all year round, but fulfillment and delivery of your order will not take place until November to February. Bare root orders placed in November will be subject to a short delay as we have to dig our roses out of the field to fulfill your order! For field grown (bare root) roses, delivery is cheaper because the roses, when dormant, are much lighter, less bulky packages. We begin lifting bare root/field grown roses in November and begin with the earliest orders. This means that roses ORDERED at the peak time of lifting and despatching (Oct/Nov) will be subject to a delay of between 4-5 weeks. After clearing back orders, from December onwards orders should be despatched within five to seven working days of receipt. Delivery of bare root plants are usually by Royal Mail or Hermes on their 3-5 working day schedule, but we are unable to guarantee a specific delivery day. There is no harm to the roses during this period as they are completely dormant.